Last month I wrote about a moisturizer called Anavita Moisturizing Anti-Wrinkle Cream. I am still using this moisturizer and love it. Anavita goes on easily but is thicker than a lot of my other moisturizers right now. I am not certain if that means it is better but I like how it goes on. I don't ever feel like I didn't put enough. Sometimes with my lighter ones I reapply until I can feel it on my skin. Disclaimer: Sponsored Post. No monetary compensation was offered or received to host this giveaway. The product will be shipped out by the sponsor. The lines that I have on my forehead bother me the most, they seem to be worst and make me look like I'm scowling. Thank you. I don't like the lines by my eyes and my mouth area has wrinkles too. Actually, the lines around my mouth (seems to run in my family) really bother me the most. Laugh lines bother me the most. The frown lines, I hate the most. My eyes and forehead really bother me. The lines around my eyes. I have really good genes and so far at 51 I don't really have a lot of wrinkles. I would give this to my mom. I am bothered most by the fine lines around my mouth. The wrinkles in the corner of my eyes are the ones I hate the most. 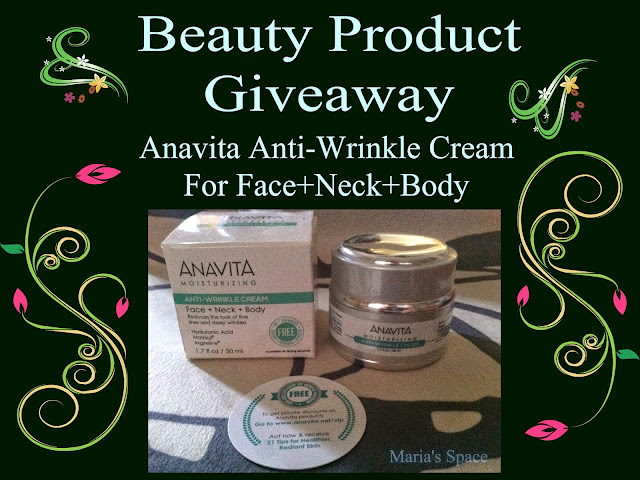 I would love to win this to help with my fine lines and wrinkles around my eyes, mouth and forehead. I hate the lines between my eyes, but more so I hate the jowl lines! Fortunately, I only have lines around my eyes right now. They do both me though. I'd love for them to appear less "deep". Thank-you! The lines around my lips bother me the most.